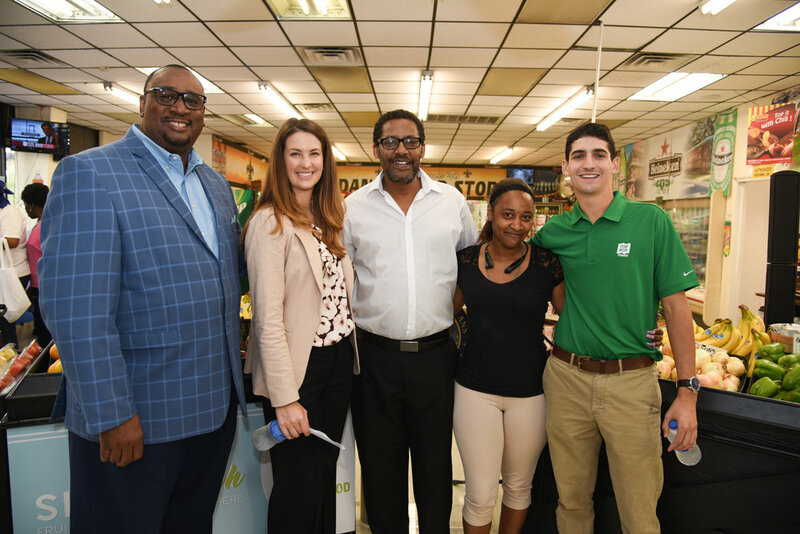 The New Orleans Healthy Corner Store Collaborative works alongside New Orleans corner store operators to maximize their business sustainability and increase the amount of fresh, healthy food they offer in-store. Hosted by Propeller, funded by the City of New Orleans, and operated by Liberty’s Kitchen and Top Box Foods, the Healthy Corner Store Collaborative is modeled after current, successful healthy corner store projects around the country, including the Urban Food Project in Birmingham, AL, the Food Trust in Philadelphia, PA, and DC Central Kitchen in Washington, DC. 66,679 units and 25,370.13 lbs. of produce sold to customers in low income and low access areas of New Orleans. 1 in 3 New Orleans adults are obese, and only 1 in 5 consume at least 5+ servings of fruits and vegetables per day. Each additional meter of store shelf space devoted to fresh vegetables is associated with an additional 0.35 servings of vegetables per day consumed by shoppers. There are 152 corner stores in Orleans Parish alone (defined as a small retail business selling a limited variety of food and other products). Corner stores are common in low-income settings. Food offerings in these stores are often limited with a majority of options being cheap, high-fat, high-sugar processed foods.